Still talking about junokata... Sorta... By talking about its opposite, gonokata. It was only fairly recently that the reconstructed gonokata was revealed to the general public. It had essentially been all but lost for years. I'd heard over the years that different sensei (most notably, Mifune) had used their own forms of gonokata for a while after Kodokan dispensed with theirs. But until recently I could find almost no information on any old masters' ideas on gonokata. That got me thinking some years back about what might be a good alternative, if one wanted to institute a program balanced between junokata and gonokata (and if you couldn't find any info on Kano's gonokata). 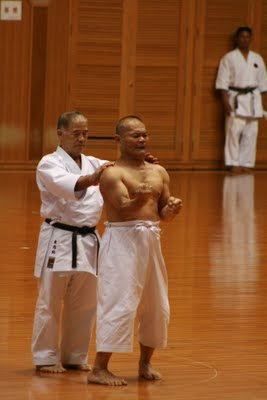 So, I got to thinking... which Okinawan kata best exhibits the pliable strength ideal of gonokata? Which Okinawan kata would make the best complement to junokata if someone were interested in building a program around these two ideals? Which kata do you think fits the bill? Which one do you think I would probably choose?